I have a shapefile that is being used as an input into the start of a model. The model is very simple but makes up a much larger model. The input is reprojected in the first step but is not needed ever again. Is there a way I can simply delete that shapefile permanently from my computer within the modeler itself? I think the only way to this currently is to write a custom script which removes the layer from the table of contents and then deletes the shapefile. Not the answer you're looking for? Browse other questions tagged qgis qgis-modeler or ask your own question. QGIS Modeler flexibility and errors? How to join a buffer (point) to a line in QGIS 3.0 modeler? 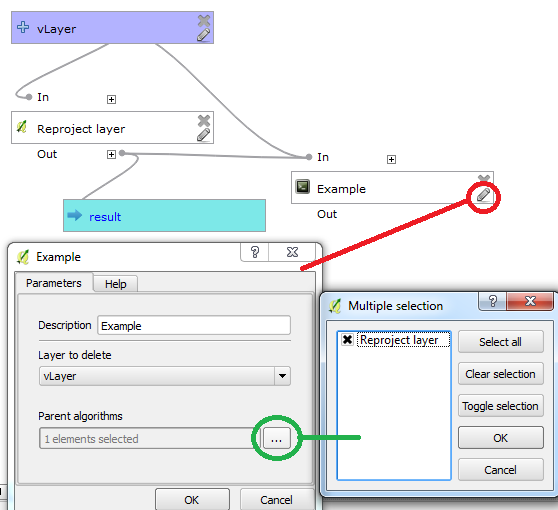 Save selected features not working in QGIS 2.14 Modeler?